. 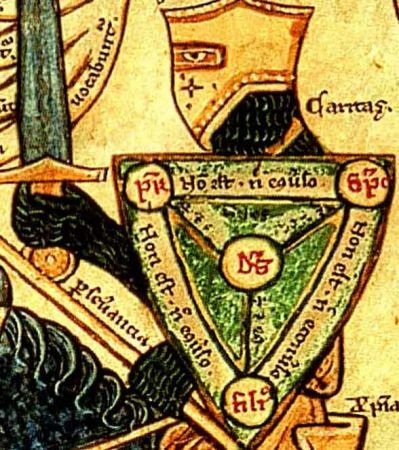 . . we worship one God in Trinity, and Trinity in Unity; neither confounding the Persons, nor dividing the Essence [“substantiam”]. For there is one Person of the Father; another of the Son; and another of the Holy Ghost. But the Godhead of the Father, of the Son, and of the Holy Ghost, is all one; the Glory equal, the Majesty coeternal. Such as the Father is; such is the Son; and such is the Holy Ghost. The Father uncreated; the Son uncreated; and the Holy Ghost uncreated. The Father unlimited [“immensus,” beyond measure]; the Son unlimited; and the Holy Ghost unlimited. The Father eternal; the Son eternal; and the Holy Ghost eternal. And yet they are not three eternals; but one eternal. As also there are not three uncreated; nor three infinites, but one uncreated; and one infinite. So likewise the Father is Almighty; the Son Almighty; and the Holy Ghost Almighty. And yet they are not three Almighties; but one Almighty. So the Father is God; the Son is God; and the Holy Ghost is God. And yet they are not three Gods; but one God. So likewise the Father is Lord; the Son Lord; and the Holy Ghost Lord. And yet not three Lords; but one Lord. Glad to see your new OP. Always timely. Thanks. Homoousios means “of the same substance,” “of the same essence.” Homo means “same” and ousia means “essence.” The term was used by Athanasius in his correct teaching of the oneness of the Father and the Son in that they are the same substance, the same essence of divinity. The term was used in the Nicene Creed (and creeds thereafter) when it described Jesus as being of the same substance as the Father in its affirmation of the Trinity. These sorts of diagrams are supposed to help us, but I am still often puzzled. Here we have A=B and B=C, but not A=C . I do not understand. If the ‘est’ (‘=’) here are supposed to be interpreted not as ‘simple identity’, but ‘identical in some manner’, as PaoloV seems to be leaning towards, then we do not have plain ‘est’ after all. I’ll still puzzled. Do you not understand that a set can be comprised of different things that all have commonality but which are not the same? Such as: the plant kingdom being comprised of different kinds of plants? WM: So God as a set or group. ‘There is one God’, but not ‘God is one’. KF: So the three persons or faces have the same ‘essential nature’ (homoousia): that is standard. Now you are talking: they are similar in a different sense to that by which they make one. (Accidents vs Essence, I presume). PV: we try so hard to understand, using all sorts of ideas from Aquinas that might help, but, after only 6 comments: are you advising us to give up? Or not? What happened to all KF’s (good!) insistence on being strict with logic? Is it never enough to understand? As a Christian, don’t you think we would have some rationality (or insight) from God that would help us to clarify these problems? Wayne Grudem in his Sys Theol, points out that there is a gap between what is clear in itself and what we can see. This echoes Jesus’ teaching in the Sermon on the Mount that the eye is the lamp of the body, so that if they are bad and what we think is light is darkness, how great is our darkness. I believe this in part responds to Plato’s parable of the cave [e.g. Sepphoris was 5 mi from Nazareth and was a major construction site, a Greek city complete with Theatre], on how shadow shows can be confused for reality and on how hard it can be to be enlightened. Then, on trying to return and help others, there can be serious or dangerous resistance. Let me throw a side-light. Is it possible to stand at one and the same place and be due north of London, New York and Tokyo? At first, it seems not, but then if we shift from the usual flat maps to the globe, we see the implications of the North Pole. That is, our preconceptions can mislead, and we may unconsciously distort by applying an incorrect (albeit useful for other purposes) model or context or frame. Going back to the OP, once we see the difference between a simple unit, a composite entity [made up from assembled, independently existing parts] and an inherently complex unit, we can have much of the conceptual background to understand the subtleties of unity. Likewise and as was pointed to in the main discussion thread, we should recognise a lesson from a triangle: each vertex is different and without any one the triangle is not, but so soon as the three are present so is the triangle. Similarly, water has a common nature but at its triple point exists in three diverse manifestations, solid, liquid, gas. Ordinary familiar “flat” space has in it three distinct dimensions but is a unified whole. All of these point to one of the longstanding issues and challenges of philosophy, the one and the many. Unity and diversity. That which unifies and that which gives distinct identity. In this context, is is not mathematical equality. It is an identity of being, nature: In Christ the fullness of God is incarnate in human form. The Spirit sent by Father and Son is of the identical nature. Without the Logos was not anything made that was made, likewise the hovering Spirit broods on the face of the unformed waters. Before Abraham was I AM, speaking of self-existence, eternality, necessary being. The Son is the out-raying of the Father’s glory, and much more. So, we see the logic, not of simple unity nor of assembly to yield a complicated constructed entity, but essential unity that inherently embeds diversity. The problem we face is not logic but conception. And full understanding lies beyond. Rather reminds me of Quantum theory, where we may talk of wavicles, wave groups etc but still, how an entity may show particle characteristics and wave ones becomes a now century-long puzzle. No, that’s worldly wishful thinking out of deep ignorance of the Christian Bible. God determines who understands what, how much and when. We don’t. Don’t be hatin’- The Holy Trinity is contrived. We used to talk about this in religious studies in my years at Catholic schools. That is the reason Sir Isaac Newton was a Unitarian. The point is that is why it seems that way to anyone not familiar with how it came about and what it stands for. So God give certainty to those who made the above diagrams, and such as Athanasius, but not us now. We just have to follow without understanding. It certainly looks like that! After all, logic tells that what is one is not what is three (in the same sense). But, since you all say that can presently we cannot understand any more, I am beginning to doubt the accuracy of the conceptions we think we already understand about God. Your other analogies are suggestive, but mostly for them we think by trying harder we CAN begin to understand them unambiguously. And many theologians emphasis the fundamental ‘simplicity’ of God. 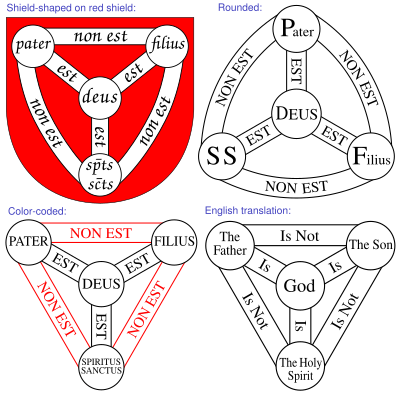 They make good arguments, but make the trinity harder to understand! Speaking of the economy of salvation, the bible records that it is the job of the Holy Spirit to lead us into all truth, so if one wants to understand better the nature of God one would be advised to take up a closer relationship with Him. A conversation with me may or may not profit. SM: Are you sure that, if I ‘do the experiment’, I will get the same results? What do you mean by “give certainty”? Who do you mean by “us”, “we”? Also, what do you mean by “have to follow”? PV: You don’t know what those words mean? Don’t words have contextual meaning?